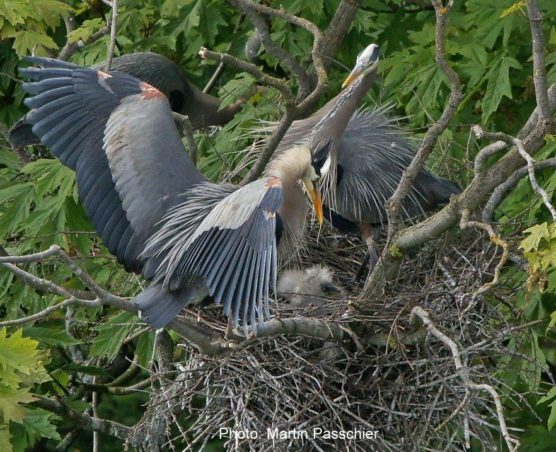 (Cover photo: Martin Passchier) What better day than the Spring Equinox to announce the return of the Pacific Great Blue Herons to their colony in Stanley Park! 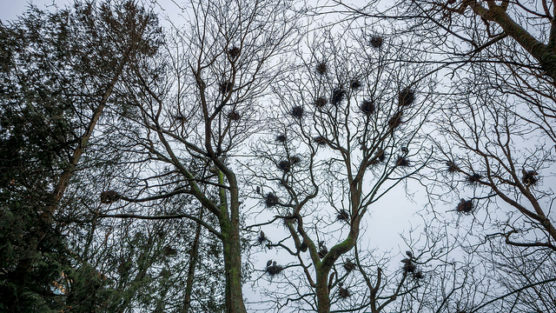 Since 2001, the heronry beside the tennis courts and Park Board offices has grown from 6 nests to more than 100, each spanning one meter! Every year at this time we wait to see if the herons will return to this site. On March 19, we confirmed 80 herons in the nests among 12 trees by the Park’s tennis courts. They don’t always stay put, though: the first recorded colony was in 1921 at Brockton Point, then they took up residence in the ‘60s by the Aquarium, finally settling at their current location over the tennis courts by the Park Board offices in 2001. The herons in Stanley Park are a non-migratory subspecies of the Great Blue Heron which is common throughout North America. 80% of the world’s population of this subspecies lives in BC’s Lower Mainland and eastern Vancouver Island. This population must compete with BC’s fast growing communities for space along seashores where the herons feed and breed. As such, the Pacific Great Blue Herons (Ardea herodias fannini) are now classified as a Species at Risk. SPES monitors the Stanley Park population every year to track their breeding success and population health. You can support our monitoring program by Adopting a Heron Nest at http://stanleyparkecology.ca/get-involved/adopt/heron-nest/ . It makes a great gift! Cool heron fact: Herons have special feathers that crumble into a powder. They use the powder to clean off fish slime by rubbing it on their head and neck feathers.